Golden Age follows a sinuous line linking intermittent crack systems with sections of face climbing. Golden Age is very sustained with every pitch featuring several cruxes, consistent 5.11 climbing with one pitch of 5.12. Burly laybacking, difficult jamming, punchy cruxes, and several exciting roof maneuvers are some of the characteristics of this beautiful climb. All belays are fully bolted, and there is excellent protection throughout the climb. The route was set up to encourage repeat ascents. The clean, golden granite is highly featured with miraculous crimpers and pockets that allow passage through otherwise blank crux sections. The fourth full length free route to be added to the wall. Colin Moorhead and Tom Wright established the climb over 4 days. Taking advantage of spring snow in the approach gulley and the straightforward 4th class ledge system (the Becky Route), the teamed opted for a top down approach. Some large trundles and epic top rope sends were realized but progress was slowed by intermittent bursts of precipitation and regularly scheduled union breaks. Excellent, albeit hot weather was had on the final ascent day. A coin toss determined order of leads and both climbers freed every pitch. Park at milepost 166, just west of the pullout for the Burgundy col approach. Hike directly up the gulley to the base of the wall. The gully holds snow early in the season and mountain boots will be an asset, by mid summer the gully is predominantly scree, one steep step can be passed on the left. There is water in the gully into late summer. After approximately 1 hour exit the gully onto a narrow ledge leading back right to the first pitch which is identifiable by a prominent 4-5 inch left arching corner. Alternatively several pitches could be added to the day by starting on the lower apron of The Tiger or Ellen Pea and walking left on a large ledge. Foreshortened photo, upper pitches are longer than they appear. 5.11c. 35m. The prominent left facing corner starts with some delicate, thin corner climbing which leads the burly 4-5 inch layback, at solidly wedged chockstones move left to a rest before punching it through a short, physical roof. This is the only pitch that requires the #5 cam, it can be left at the anchor and retrieved on the way down. 5.11d. 35m. Easy climbing, leads to physical crux over another rooflet. Face climbing gains a shallow left leaning crack which peters out with a desperate lunge to ledge. Easy climbing up a left facing corner leads to “Smoke Break Ledge”. 5.11a. 25m. Climb up a ramp and across a golden panel, a technical, reachy crux leads past flakes and up to a steep ramp and the belay. 5.12b. 20m. Pumpy laybacking leads to a rest. Launch out right through an overlap to a powerful traverse crux, surf along the bathtub rail to a second crimpy crux that guards the belay. 5.10d. 15m. A tricky mantle off the belay leads to an awesome hand traverse crack and an awkward mantle onto the belay stance. 5.11a. 35m. Climb a pleasent flake to thin, bolted crux. Steep, juggy climbing leads out to the apex of the overhangs and a burly hands roof crack, continue straight up until it is possible to hand traverse right to a belay. This pitch is a little loose in places, fortunately the belay and lead line are out of the line of fire. 5.11c. 15m. 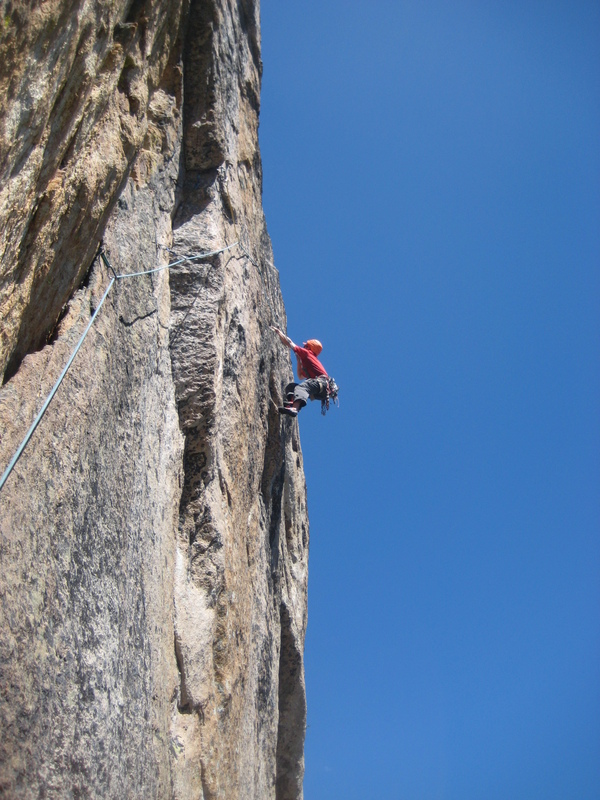 Climb up towards arete on perfect crimps and bulletproof gold rock. Move left to a final cruxy mantle. Double set of cams from thin fingers to #1, 1x #2, #3,#4,#5. One set wires. Quickdraws. No micro’s necessary. Rappel the route with one 70m rope. The second rappel anchor from the top is offline to the left (shown in photo topo).